2Po or where Po is the output power, Vck is the voltage between collector and emitter, and Ic is the collector current, In practice a value in the range from 1500 to 5000 ohms is emitter capacitor in a transistor Colpitts oscillator circuit capacitance (Cr) is known, in this caser capacitance of 355 pF requires a collector-omitter usually used. .r r transistor only requires a gain of one or unity, but in practical circuits the gain must be greater than unity because if it were not, aging of the components would eventually result in discontinuance of the desired waveform because of gain reduction. The minimum excess gain that will assure starting is usually about 50 to 100 percent for ordinary circuits. When the gain is greater than one, more signal is fed back than was originally present, and a buildup in signal level results; however, this increased signal will always be limited by the inherent nonlineari-ties in the transistor. These nonlinearities will result in some distortion of the output waveform, but in good oscillator design the distortion should be very slight. Choose a transistor that has an fr several times greater than the frequency of operation; it should have a value of forward current gain (hf*) of at least 5 at the frequency of oscillation. 2, Design a bias network which will result in the desired operating conditions. Use the manufacturers recommended operating point. 4. lie total tank capacitance (Or) found in step 3 is equal to the equivalent capacitance of Ci and Ca in series. These capacitors must have a ratio that satisfies the equation lit* > Gj/Ci. Since the forward current gain of the transistor should be about five times greater than that required for oscillation, this condition is satisfied if we use a starting value of hx« in choosing Ci and Cs. The starting value of hu is simply found by using % of the actual transistor hr* in our calculations. This will ensure an adequate margin of safety in our design. When the total capacitance (Or) and starting ht* are known, the value of the collector-emitter capacitor (Ci) may be found from the nomograph of Fig. 9, Then the required value of emitter-base capacitance (Ci) may be calculated by multiplying Ci by the starting hi*. 5. 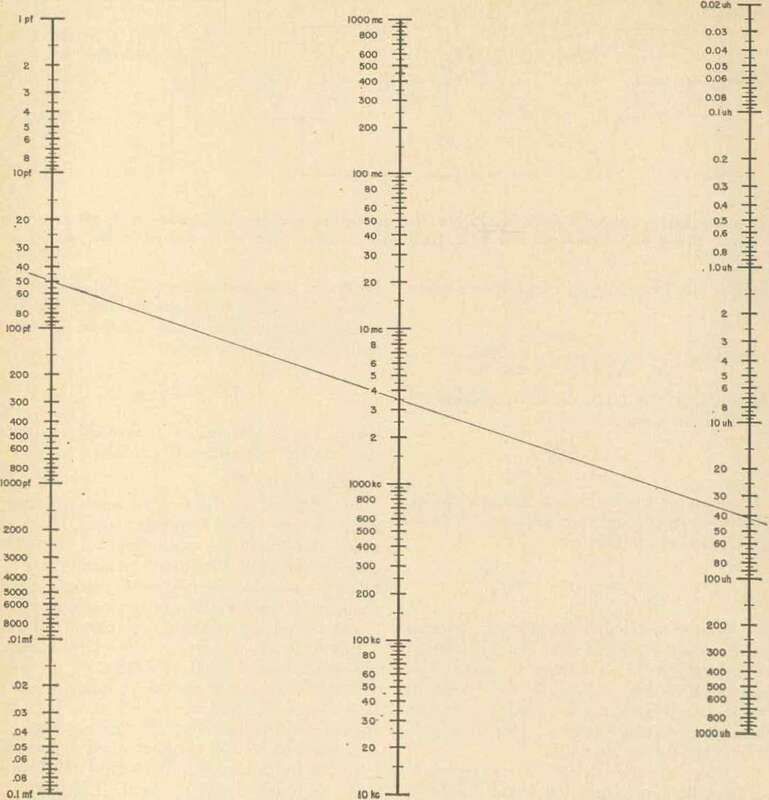 From the nomograph of Fig. 6 choose a value of inductance that will resonate with the total capacitance at the desired operating frequency. This recipe may seem to be a little complex at first, but as soon as you use it, you will find that it is really pretty simple; all the drudgery is removed by the three nomographs. 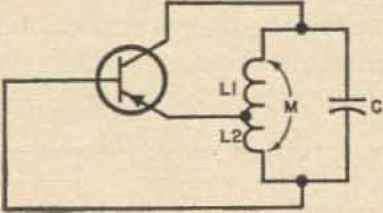 To illustrate the use of the Colpitts recipe, lets design an oscillator for 9 MHz with a 2N918 transistor. At 10 MHz the 2N918 has a gain of about 20, so we can use this value at 9 MHz. A check with the manufacturer s spec sheet shows that 1.5 mA collector current (Lc) and 7.5 volts collector-emitter voltage (Vce) is a good operating point. A nine-volt power supply, a 1000-ohm emitter resistor, a 2200-ohm stabilization resistor and a 6800-ohm base-bias resistor will satisfy the biasing requirements (Fig. 10). The required load impedance can be found from Z = Vcu/Ic; in this case 7.5 volts/1.5 mA = 5000 ohms. 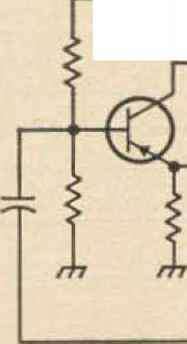 Choosing the value of circuit Q to be 100, a load impedance of 5000 ohms and operating frequency of 9 MHz, the total tank circuit capacitance from the nomograph of Fig. Here again use the next largest standard value, 1800 pF. Fig, 10. Practical 9 MHz Colpitis oscillator do* signed with tb© procedure outlined in *ho text. 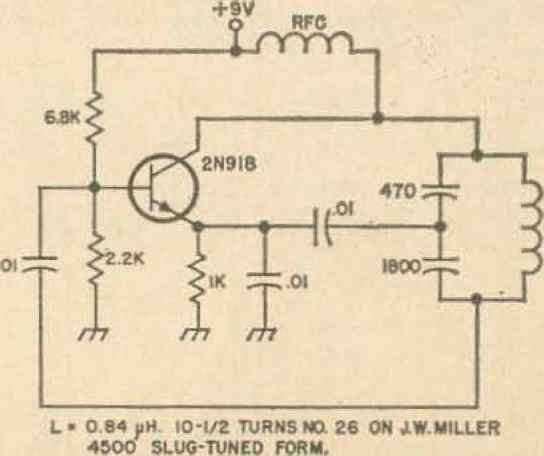 The completed circuit is shown in Fig, 10. When this circuit was constructed on the bench, it started osc lating as soon as power was applied. 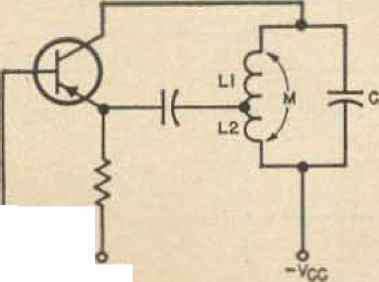 The collector current was 2 mA and the collector to emitter voltage was 7 vo]ts—very close to t fie desired operating condition. The frequency could be tuned from 8.7 to 11.6 MHz by tuning the slug-tuned coil, The output voltage, measured at the collector with a VTVM and rf probe, was 4.4 volts peak to peak.